Driveway Drops – What is that? Time is of the essence to get the message out about your lost dogs. Many times it is just plain overwhelming when you realize how many houses there are in your area.. 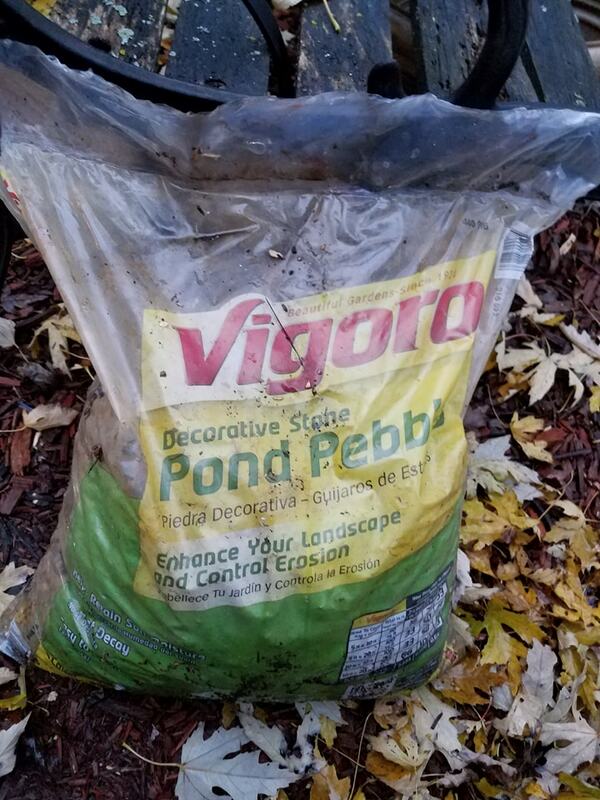 Enlist your neighbors, kids and friends to help you put the driveway drop bags together. 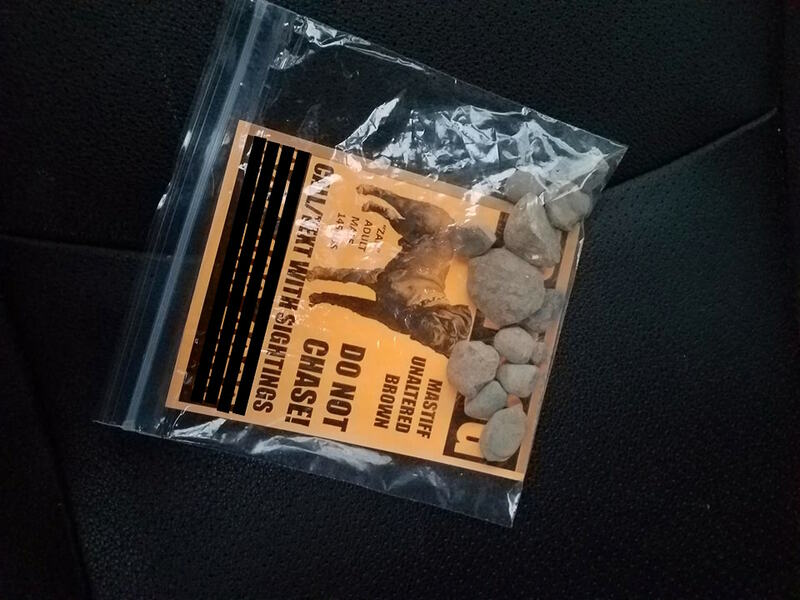 Put pebbles and flyer into a sandwich bag. Easy peasy to make and to distribute. 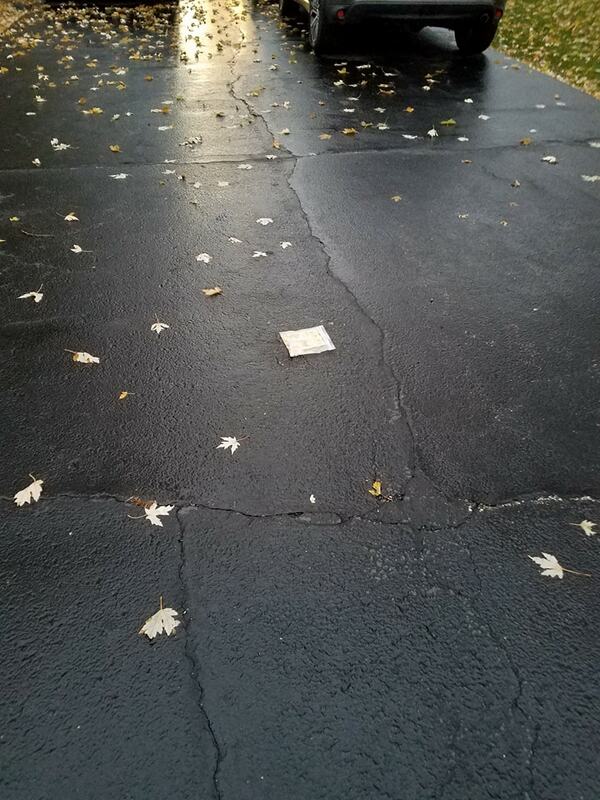 Have one person drive and the passenger toss the bags into the driveway. 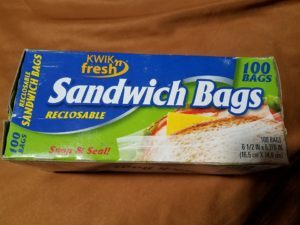 Some owners have done 500 bags in one night. Thank you, Kim, Rosanne, Elaine and Colleen for your commitment to bring lost dogs home and idea of driveway drops! This entry was posted in Search Strategies, Usefull Tools on November 16, 2017 by Susan. 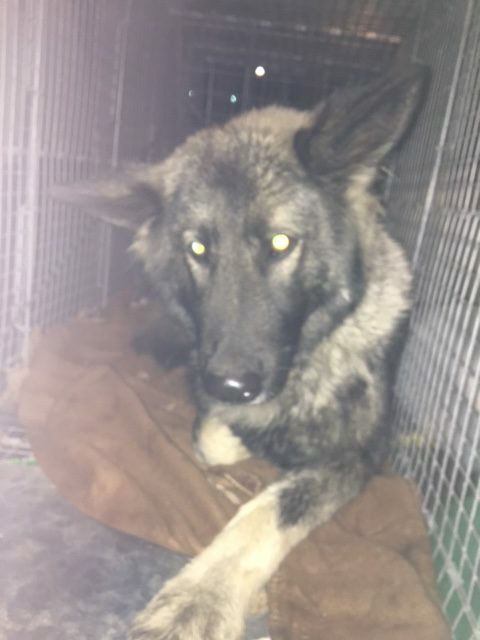 Two weeks ago, my brother started to notice a skittish shepherd running loose in his district at night. He began to leave food for her when he figured out her route. 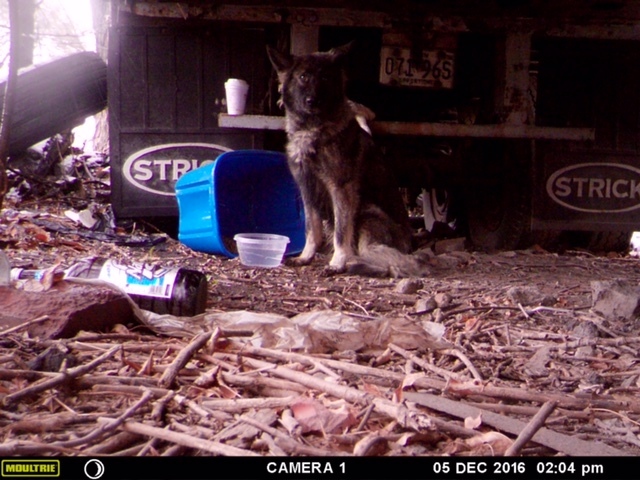 This smart girl was going through a hole in the fence of a trucking lot where she likely bedded under a trailer for warmth and safety. Any attempt to approach her was met with her fleeing. FiFi at her feeding station. Using a rubbermaid container to protect the food. FiFi laying next to her feeding station. Last week I came to try to trap this sweet girl with my brother. I set the trap up under the trailer where she usually darted under. She’d be hungry and it would be quick. Not so fast! She didn’t even touch a morsel of the warm food trailed in. The trap was new in her spot and spooked her. So, we placed a camera and bungeed the trap open-ended with food in the middle. Fifi getting use to the trap. 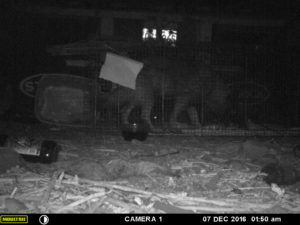 Within 2 nights, it was evident that she was comfortable with the trap; she walked in and out to eat with ease. 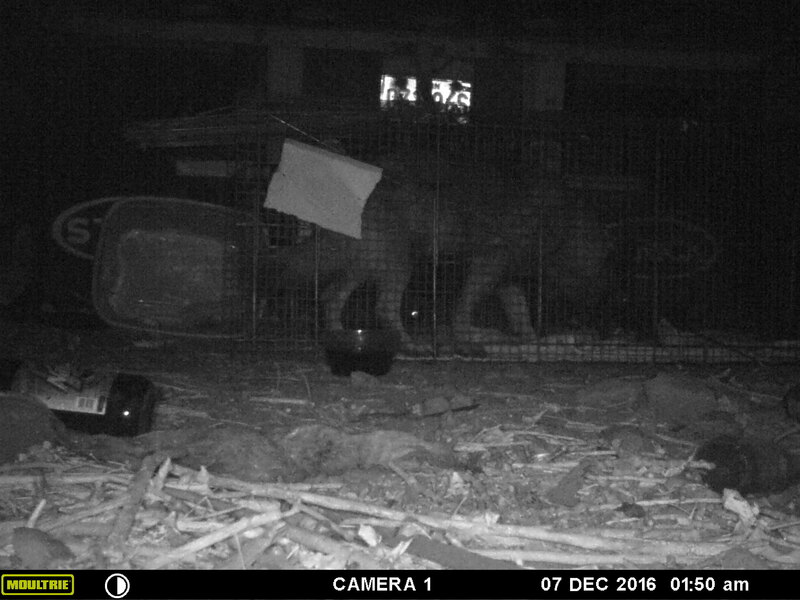 Last Wednesday night, before the snowfall, we baited and set the trap just at about 1:15am. Like clockwork, she showed up. We pulled away, shut the car off and silenced our phones. Within MINUTES, she was caught! Our patience prevailed! Fifi caught in the trap. Unfortunately, she didn’t have a microchip. She was thin, matted and covered in burrs, but walked beautifully on leash and was used to being in a car. I posted her to Lost Dogs Illinois and took her for a check-up and to get cleaned up at the vet thanks to Trio. She was then transferred to a local open-access shelter for her stray hold. 5 days later, I received a phone call, text and email- someone thought it may be their lost dog, Fifi. Fifi went missing on 11/19/2016. After exchanging pictures, it was evident that this was her! Fifi traveled over 4 miles from her home when her gate was accidentally left open. She likely traveled a long running route her owner takes with her that lead her to where we trapped her. Her owner hung flyers near their house, not realizing the far distance she had traveled. He was then looking through the ‘Is This Your Lost Dog’ album on LDI’s Facebook page when he saw my post. She was missing for 3+ weeks! Fifi is now microchipped and safe with her owners. She cried out in delight and coated them in kisses when they were reunited at the shelter. It was truly beautiful. When shy/skittish dogs are lost, they travel a lot at night, when there are less people out to notice. I am truly thankful for my brother and other CPD officers who spotted her. Without a feeding station being set, she may have left the area. Fifi also reminded us of the importance of patience with lost and stray dogs. She went into the trap on her own time and comfort level. Fifi’s owners never gave up looking for her 3 weeks after she went missing. They were persistent! Huge thank you to Lost Dogs IL– without your group’s existence, Fifi may have never made it home. Your network has such a large and wonderful impact, and truly made a family whole again. Thank you for continuing to preserve the human-animal bond and helping us remember to think lost, not homeless. Thank you Katie Campbell for sharing your most excellent trapping and reunion. This entry was posted in Feeding Station, Found a Dog, Trapping, Uncategorized, Usefull Tools on December 16, 2016 by Susan. 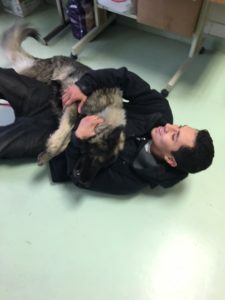 Chicago Animal Care and Control took one giant leap for petkind recently by adding a high-tech ID tag-engraving machine to its shelter facilities. 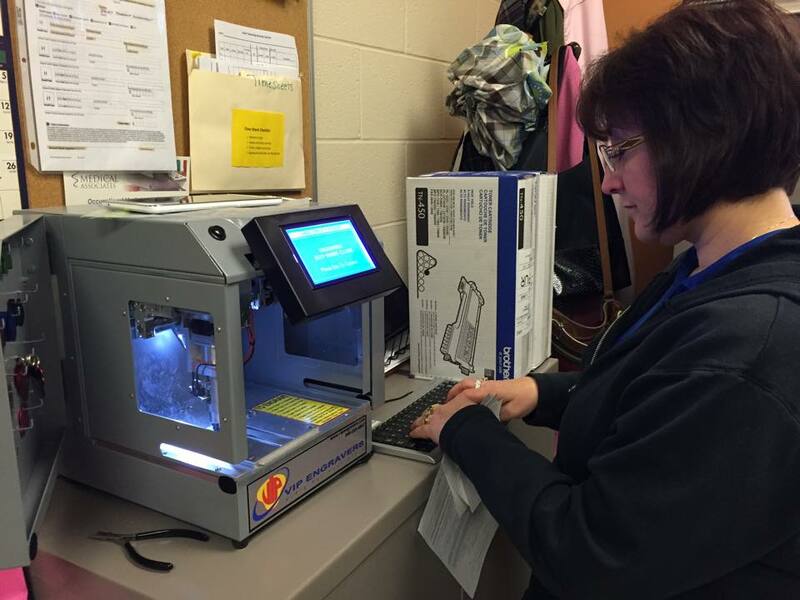 CACC Administrative Services Officer Susan Cappello said the non-profit group, Friends of Chicago Animal Care and Control, donated a VIP Pet ID tag machine to the shelter in January 2016. 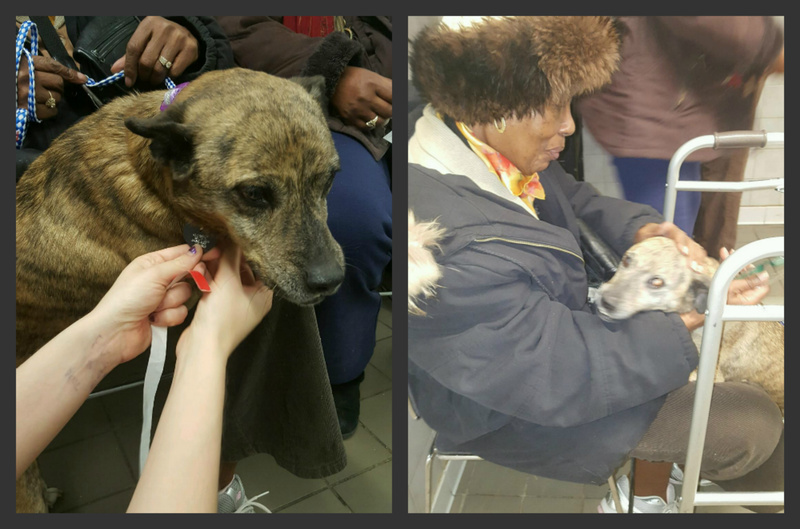 Cappello added that CACC’s next low-cost vaccine clinic will be held Feb. 17 and that “[W]e plan to provide a pet ID tag to every customer” that day. Providing pets with ID tags can help shelters reduce overcrowding. A 2010 study conducted by The American Society for the Prevention of Cruelty to Animals suggested that pet ID tags containing owner contact information make it easier for people to help get that animal home should it become lost. That allows a shelter to direct its resources to supporting true homeless pets. 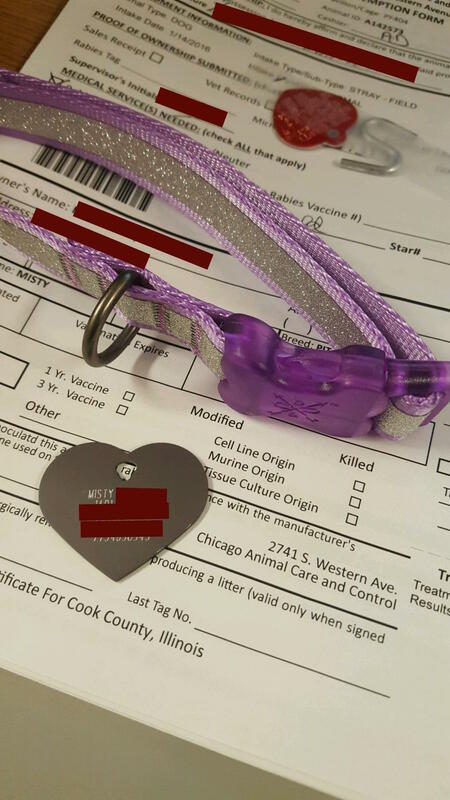 Chicago Animal Care and Control strongly recommends that all pet owners microchip and obtain a collar and tag for their pets, Cappello said. “Cats that get lost are nine times more likely to be reunited with their owner if they arrive at a shelter with a collar and tag or microchip,” Cappello emphasized. “Dogs are five times more likely to be returned home to their owner if they have a collar and tag or microchip. CACC joins Joliet Township Animal Control as two major Northern Illinois municipal animal control programs now offering ID tags as part of the adoption/retrieval package. JTAC, which serves Joliet, Joliet Township, Crest Hill and Rockdale, used part of a $20,000 grant awarded it by The Petco Foundation, in partnership with Natural Balance Pet Foods, to purchase its machine in March 2015. Thank you Lydia Rypcinski for writing this article! This entry was posted in Animal Control/Stray holding facilities, ID TAGS, lost dogs, Usefull Tools and tagged animal control, animal shelters, ASPCA, CACC, City of Chicago Animal Care and Control, Friends of Chicago Animal Care and Control, Good Samaritans, ID tags, Joliet Township Animal Control, lost dogs, Lost Dogs Illinois, microchip, Petco, return to owner, Stray holding facilties, VIP ID Tags on February 3, 2016 by Susan. 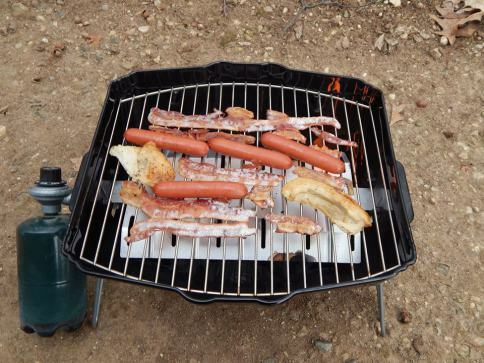 Using a portable grill can be very helpful in catching a shy, scared dog. If you are getting sightings of your dog in a general area, we recommend setting up a feeding station. This can help to keep a lost dog in one area and eventually lead to capture. However, sometimes it is difficult to get a lost dog to find the feeding station. 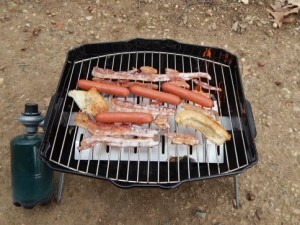 Grilling meats with a portable grill can help! The smell of bacon or bratwurst cooking on a grill is very strong. Humans can pick up the scent of grilled meats when someone in the neighborhood is grilling out. Which means a hungry dog can also pick up that yummy, tempting scent, but from an even greater distance since dogs have a much better sense of smell than humans. When you are grilling for a shy, lost dog, you must do it very quietly. You do not want to scare him out of the area. Pick a location near to where your dog’s sightings have been, but make sure it is an area that is people-free and safe for your dog (away from roadways, train tracks and thawing ponds). If your sightings have been consistent and you suspect that your dog is using a regular path of travel, then we recommend grilling near that pathway. This can improve your chances of your dog finding the tempting food. It is also important to get permission from the landowner to grill on their property. Make sure to read and abide by the grilling instructions included with your portable grill. Never leave a grill unattended. Once you choose the location and receive permission from the owner of the property – you can begin. It is best to only have ONE person grilling to prevent your dog from getting scared away by the sounds of your voices. Remember, for a shy, lost dog – two’s a crowd! Once your grill is set up and the meat is cooking, quietly sit in the area for as long as it takes to cook. When the meat is cooked, you can place it on the ground or in your dog’s dish. 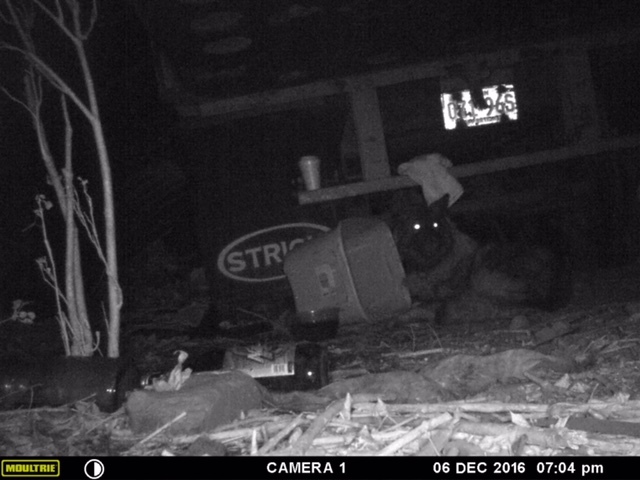 If possible, set up a trail camera facing the grilled food, so you will know who has stopped by to eat and when (set the time/date function on the camera). Don’t be disappointed if your dog does not find the food within 24 hours. Just grill quietly again the next day and leave the area. If your dog is seen eating the grilled food, it is important to continue to keeep yummy, tempting food at this location. He or she will be sure to stop by again for more. Once you know that your dog is coming to this feeding station on a regular basis, you can consider setting up a humane live trap near the food. Please see our articles on humane trapping for details. Good luck and happy grilling! Remember, your lost dog is depending on YOU to bring him safely home. 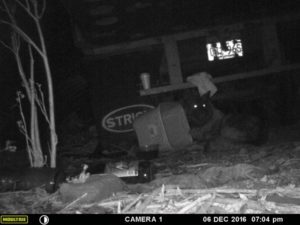 This entry was posted in Feeding Station, lost dogs, Shy Lost Dog Strategies, Sightings, Trapping, Usefull Tools and tagged grilling, sightings, Trail camera on February 8, 2015 by Susan. 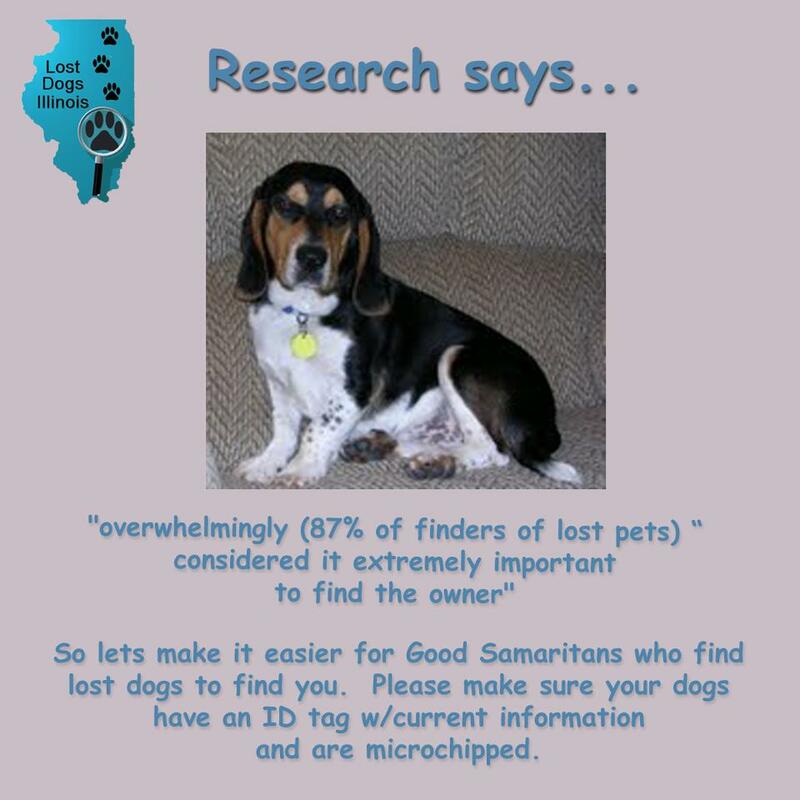 We are very pleased to announce that Lost Dogs Illinois is now partnering with Helping Lost Pets (HeLP). HeLP is a totally free, map-based national lost/found registry. 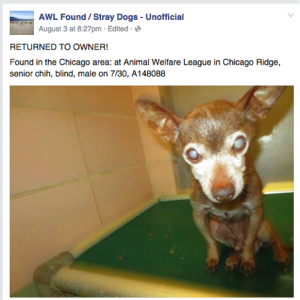 How will this help more lost and found dogs get reunited with their owners? The map-based system makes it easy for people to search for lost and found pets in their area. Listings can be searched by date, name, breed, age, gender, or size. 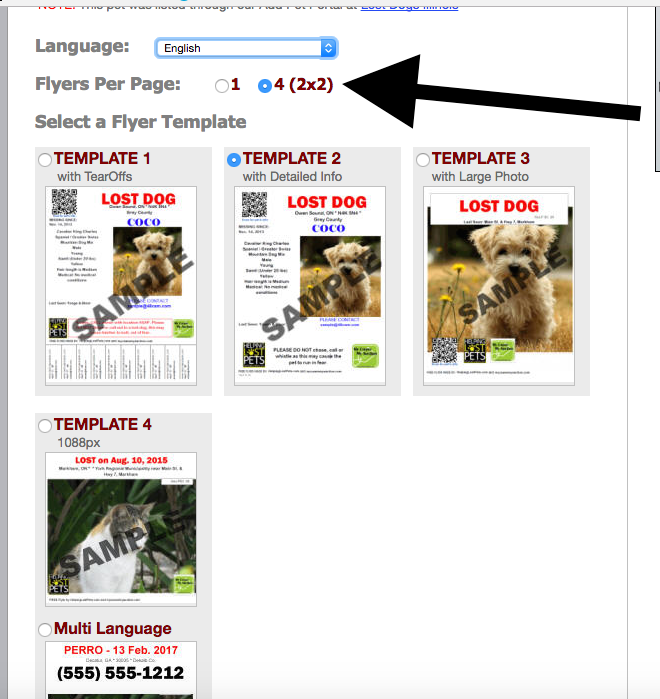 HeLP technology makes it easy for finders to produce flyers and to share their post via Facebook, Twitter, Google+, Pinterest, Linked In and more. Email and text alerts are sent to HeLP members to notify them when a pet is listed. Allows anyone to search and match lost and found pets 24/7. How will this differ from what we are currently doing? 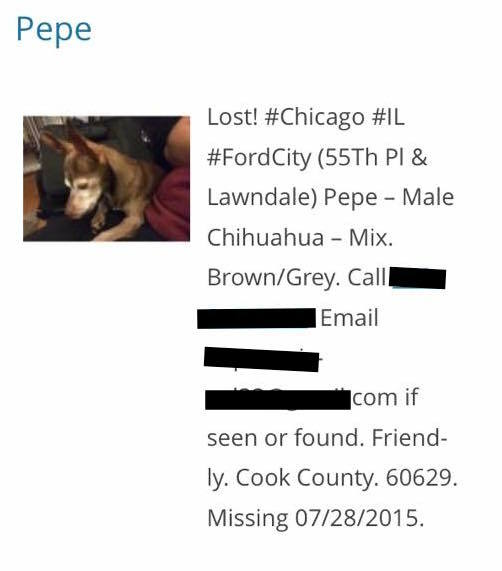 Our lost and found dog report looks different and will automatically create a listing on the HeLP map. Our posts will look slightly different, but our volunteers will still post them to our LDI Facebook page when a volunteer is available.. You can still share our post with your Facebook friends like you have always done. 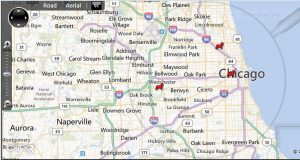 But you will now have the ability to search by area by using the HeLP map. We would like to encourage our fans, Illinois shelters, animal control facilities and stray holding facilities to check out the HeLP website and become familiar with it. It truly has the capability of being the ONE national lost and found database that is so badly needed in this country. 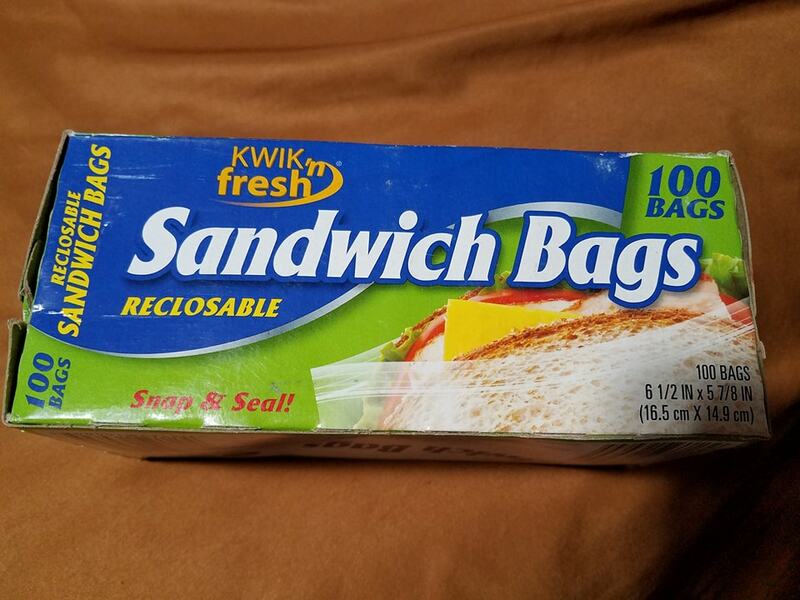 This entry was posted in Other Posting Lost and Found Websites, Our Organization, Usefull Tools on September 20, 2014 by Susan. Contact your local radio stations! This entry was posted in Usefull Tools on September 19, 2014 by Susan. Flyer, flyer and flyer some more! Your friends and family members are eager to help you find your lost dog. They are willing to do whatever it takes to bring him/her home, including combing through every street and back alley in your neighborhood. They are all waiting for instruction from you. But, what should you tell them to do? What is the best way to use their time and effort to find your missing dog? Even though it may seem counter intuitive, you should not send your friends and family members on a wild goose chase, or, in this case a dog chase, through the streets. Looking for a lost dog by wandering through the streets is like looking for a needle in a haystack. And, a dog who is approached by someone the animal doesn’t know well may get scared and run even farther from home…even if all the person was trying to do was return the dog to its family. What you should say to your friends and family members is that you’d appreciate them taking some time to put out flyers all over town. Hand each of them a stack of flyers that include a full, current picture of your dog, a description of his or her appearance that highlights any unusual physical or behavioral traits the dog has, and your contact information. 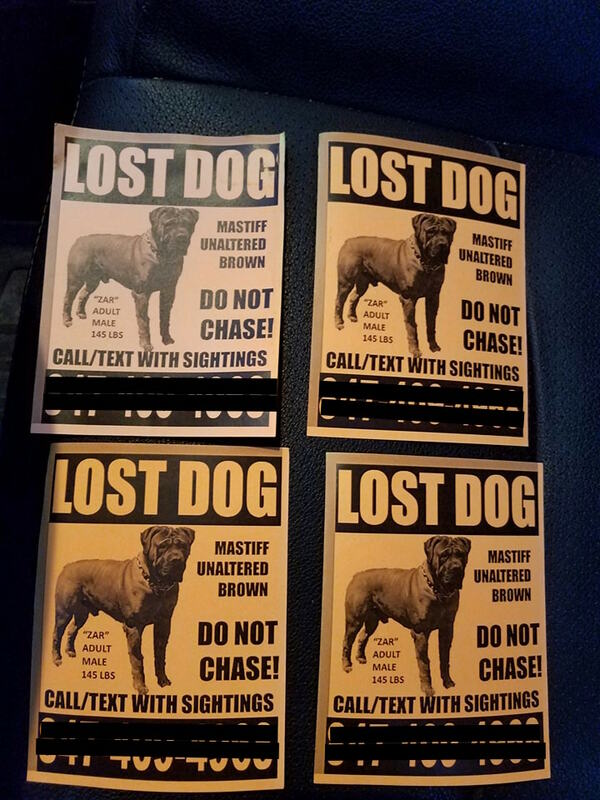 When your friends and family members look at you like you’re crazy, remind them that the most effective way to find a lost dog is by putting up and handing out flyers as soon as possible following an animal’s disappearance. More often than not, a dog is reunited with its family because someone who has reviewed a flyer sees the lost pet, and calls the dog’s distraught owners. So, if your pet goes missing at some point in the future, gather as many friends and family members as you can, and send each and every one of them out with big stacks of flyers. It is the best way to ensure your lost dog will be returned to your loving arms. This entry was posted in Search Strategies, Usefull Tools on March 9, 2013 by Susan. 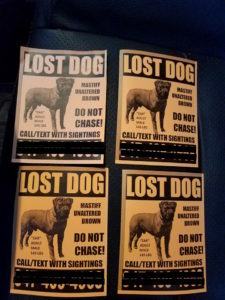 The number one way to recover your lost dog is the old-fashioned tried and true method of using flyers and signs to generate sightings. Going door to door with flyers in the area where your dog was last seen has brought the majority of our lost dogs home. But new technology is constantly giving us more tools in our tool box of lost dog recovery. There are currently dozens, if not hundreds, of lost pet websites and listing services currently available. One stands out because of several unique features. “First it has to be free. HeLP is completely free for the public, shelters, rescues and any pet-related businesses or organizations. HeLP brings together the community by giving everyone access to the same lost/found data. allows lost/found pets to be viewed on a worldwide map including a photo and full description that can be zoomed to street level. is free for the public and shelters to use. 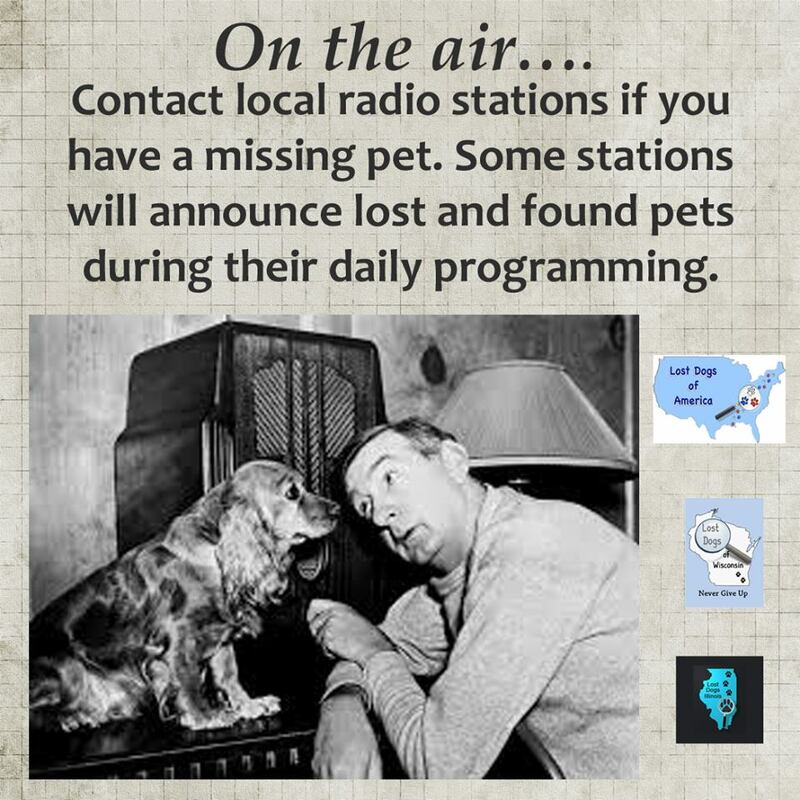 enables pet owners to easily get the word out to shelters, veterinarians, rescues, volunteer search networks and others near them via the automated email, text and twitter alerts that are generated. 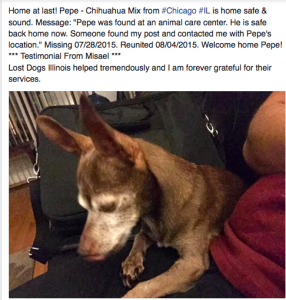 We would like to encourage the owners of lost dogs, our fans, and Illinois Animal Control Facilities, shelters and rescues to check out the HeLP website and become familiar with it. It truly has the capability of being the one national lost and found database that is so badly needed in this country. This entry was posted in Other Posting Lost and Found Websites, Usefull Tools and tagged Helping Lost Pets, lost dogs on January 1, 2013 by Susan. The number one way that lost dogs are successfully recovered is through the use of flyers and signs that alert the neighborhood and surrounding areas that your dog is missing. Printing and delivering flyers can be time-consuming and costly. Also, it is illegal for the general public to put flyers into US mailboxes. The USPS has a service to help. 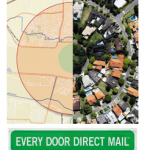 Every Door Direct Mail® costs 14.5 per piece and does not require a postage permit. How does it work? 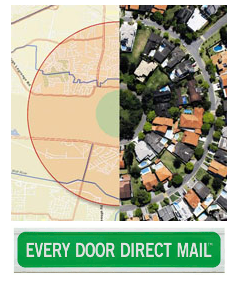 You pick the neighborhoods you want to reach, and a Postal Service Letter Carrier takes your printed flyers to every home while delivering the day’s mail. 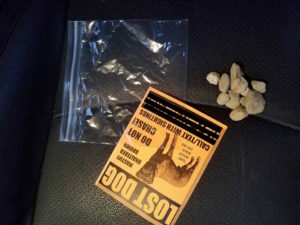 Your lost dog flyer gets directly into the hands of the homeowner. Ask your local postmaster for details. Some printing requirements apply. Our tips, ideas and articles are based on information gathered from over thousands of successful lost dog recoveries. 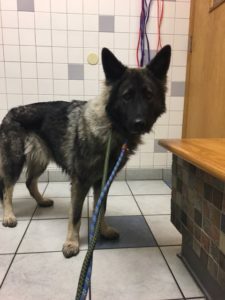 Any advice or suggestions made by Lost Dogs of Wisconsin/Lost Dogs Illinois is not paid-for professional advice and should be taken at owner’s discretion. This entry was posted in Search Strategies, Usefull Tools on November 2, 2012 by Susan.